Sponsored by AMBICO Limited, Metalphoto® Photosensitive Anodized Aluminum, Securitech Group, Inc., and Smart Vent Products, Inc. Define the building codes and federal standards that identify requirements for structures that are resistant to extreme weather. 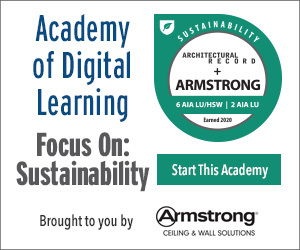 Discuss the design issues related to creating buildings that can withstand a flooding event. Assess design strategies related to wind and projectile resistance during hurricanes and tornadoes. Specify and design effective, required signage that is durable and long lasting in buildings subject to extreme conditions. The weather is always a popular topic of conversation, but it is also an important focus of researchers and government agencies. The National Weather Service (NWS), which is part of the National Oceanic and Atmospheric Administration (NOAA), has kept records for decades on weather events across the United States. In particular, it has tracked severe weather events, such as tornados, hurricanes, floods, storms of all sorts, and other things we commonly refer to as natural disasters. Its records seem to indicate a disturbing trend of an increase in severe weather events over the past several decades.1 Further, the impacts from these events related to the cost of damage or losses seems to be increasing. A report titled U.S. Billion-Dollar Weather and Climate Disasters: Data Sources, Trends, Accuracy and Biases by Adam B. Smith of the NOAA National Climatic Data Center and Richard W. Katz of the National Center for Atmospheric Research is quite telling.2 They have found that “an increasing trend in annual aggregate losses is shown to be primarily attributable to a statistically significant increasing trend of about 5 percent per year in the frequency of billion-dollar disasters.” They further indicate that inherent uncertainties and biases in the data collection suggests an underestimation of average loss of roughly 10 to 15 percent, meaning the actual loss due to weather-related damage is likely 10 to 15 percent more than reported. Fortunately, there is one positive statistic from the National Weather Service: the number of fatalities from severe weather appears to be decreasing, suggesting that we are getting better at protecting people, if not property. That is likely attributable to better communication and buildings designed to provide safer environments for people who can experience any number of these natural disasters. Image courtesy of Smart Vent Products, Inc. Extreme weather conditions, such as flooding, can cause significant problems for buildings unless they are designed and constructed to withstand them. Building codes establish a baseline for safety in buildings covering a variety of issues, including weather resistance. In areas that have been identified as being prone to a higher risk of such things as tornadoes, floods, or hurricanes, there are often localized requirements that are more stringent than national codes. Miami Dade County in Florida, for example, is well known for establishing and enforcing higher standards to protect people and property in the event of hurricanes, wind, and flooding. In some cases, a proactive approach to providing safe shelter has been adopted. Specifically, ICC 500-2014: ICC/NSSA Standard for the Design and Construction of Storm Shelters, published jointly by the International Code Council (ICC) and the National Storm Shelter Association (NSSA), has been developed. This standard is referenced in the newest building safety codes and provides minimum design and construction requirements for shelters to provide a safe refuge from storms that produce high winds, hurricanes, and tornadoes. The premise here is that the magnitude of wind speeds associated with these events require occupants of standard buildings to evacuate the area or seek protection in a shelter designed for resistance to extraordinary wind loads and flying debris. This approach isn’t limited to stand-alone shelters either since the latest ICC Codes now require storm shelters in educational occupancies and critical emergency operation centers located in areas prone to extreme tornadoes. That means such shelters, or rooms and facilities that can serve as those shelters, must be included in the design and renovation of many buildings. The ICC-500 standard provides architects and other design professionals with minimum code requirements for the main wind-resisting structural system, openings, and cladding of these shelters. It also provides basic occupant life-safety and health requirements for shelters, including means of egress, lighting, sanitation, ventilation, fire safety, and minimum required floor space for occupants. Beyond codes, the federal government can influence local building design and construction too, particularly through programs and requirements of the Federal Emergency Management Agency (FEMA). It also issues standards for keeping people safe and sheltered in severe storms, and it relies on those standards to establish rates for things like flood insurance and other programs. 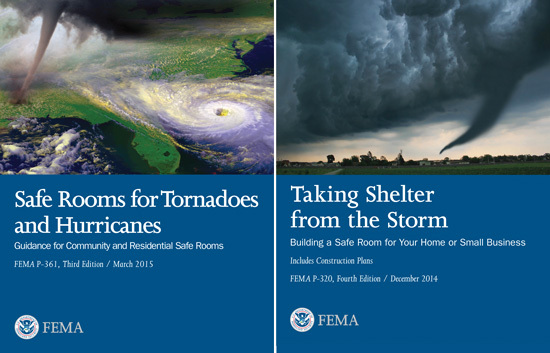 In particular, FEMA P-361, Safe Rooms for Tornadoes and Hurricanes: Guidance for Community and Residential Safe Rooms (Third Edition, 2015) addresses many of the same things that ICC-500 does, but it is more stringent in some cases. A companion publication, FEMA P-320 titled Taking Shelter from the Storm, Building a Safe Room For Your Home or Small Business now in its fourth edition, helps designers, homeowners, or small business owners assess their risk and determine the best type of safe room for their needs. FEMA P-320 also includes safe room design drawings with details geared to both FEMA P-361 and ICC-500. Design options include safe rooms located inside or outside of a home or small business. For safe rooms intended for more than 16 occupants, additional requirements kick in for the design. FEMA Publications P-361 and P-320 provide detailed requirements for safe rooms and shelters to withstand tornadoes, hurricanes, and flooding—some more stringent than the ICC-500 code. While tornados and hurricanes may grab the most media attention, flooding is actually more prevalent and more of a problem in the United States. Buildings that are designed and constructed in a known flood zone need to rely on the latest available information and standards in order to remain safe and be structurally sound. The best source of such information is a FEMA Flood Map Service Center, where the flood insurance rate map (FIRM) for a municipality can be found. This is typically the map used by municipalities to enforce their local floodplain management regulations, but it’s also used by the FEMA-administered National Flood Insurance Program (NFIP) for flood insurance rating purposes. The identified flood zone of the building along with other factors play directly into the ultimate cost of flood insurance. In addition to FEMA, The American Society of Civil Engineers (ASCE) has published Flood Resistant Design and Construction (ASCE 24-14). 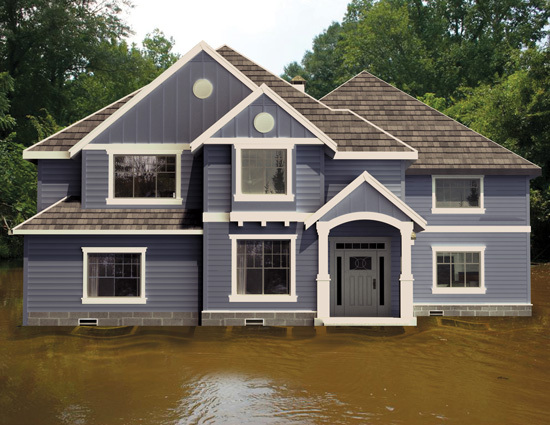 This standard, which is also adopted by reference in the model building codes, provides minimum requirements for the design and construction of structures located in flood hazard areas. It applies to new structures, including subsequent work, and to work classified as substantial improvement of existing structures that are not historic. As a professional resource, it provides essential guidance on design and construction to structural engineers, design professionals, code officials, floodplain managers, and building owners. AMBICO Tornado openings are tested to FEMA P-361 and ICC-500 (2014) standards for wind-load resistance and debris impact. AMBICO Tornado products have been tested and certified for use with Securitech hardware products. With more than 90 years of combined experience, we continue to deliver superior products. AMBICO Limited and Securitech Group, Inc.
Metalphoto® allows architects to capture rich, photographic-quality images inside of metal—providing unmatched longevity and the durable, modern look of anodized aluminum. Architects use Metalphoto® for high-value outdoor and indoor signage projects, such as wayfinding signs, blueprint reproductions, building certification plaques, and donor recognition plates. Smart Vents protect houses and buildings during floods by preventing hydrostatic pressure buildup that can destroy walls and foundations. Dual-function and insulated models are available for both residential and commercial applications. These ICC-ES-certified, FEMA-accepted Engineered Flood Vents are made in the United States from Marine Grade 316 stainless steel.